Take home one of Spider-Man's deadliest foes. It's none other than the Green Goblin! Norman Osborne, now part of the Marvel Select line. Action figure comes with the Goblin Glider! Marvel Select gives its take on one of the Marvel Universe's most popular villains. Spider-Man's longtime nemesis, Norman Osborne has never looked more menacing, wearing a detailed, modernized sculpt of the classic Green Goblin costume. 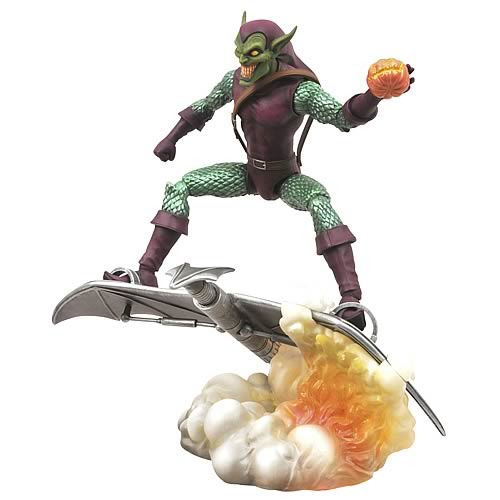 Equipped with Marvel Select's standard 16 points of articulation, this 7-inch scale action figure can perch on top of his included base... a perfectly balanced Goblin Glider wrapped in smoke! The Green Goblin comes in oversized collector packaging, ready for display. Ages 8 and up.